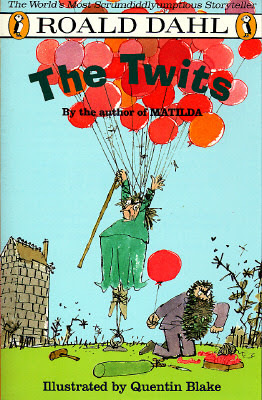 The Twits is the story of Mr. and Mrs. Twit, who are such horrible people that they have become very ugly from all their bad thoughts. They capture birds once a week to make bird pie, and train monkeys to perform in an upside down circus. So the monkeys decide to pay the Twits back for their cruelty. This was a truly delightful story. Just like Matilda and Charlie and the Chocolate Factory, this book was a quick read that had me giggling throughout. That last bit really won me over. It makes it clear that it's not "ugly" features that make you ugly, but rather being a horrible person, like the Twits. 5 stars! Good for all ages!